If you own a quilting business, then you should make an attempt to give your business an online presence in addition to your bricks-and-mortar presence. You may think you don't have what it takes, but there are some great options today that make it easy for even the most technologically-challenged of us to develop a great web site. Before even touching your computer pad, however, you should think about what purpose your web site will serve. For instance, if you want to be able to sell your products on your web site, you'll need to have e-commerce functionality, which will likely mean you'll have to apply for a merchant account to be able to accept credit cards. If your web site is merely a virtual business card-providing your contact information and product/service offerings-then you won't have to worry about e-commerce. But you'll want to write down why people will want to visit your shop and make it compelling enough that they will read it and contact you. Your Store's Description: Get creative and let the browser know why you started the shop, what kind of products you offer, and why they should purchase from you. Online Catalog: If you are selling online, you will need to put your products into a catalog and put descriptions and graphics for each. And the products need to be organized logically so customers can find the items they are looking for. Map to your store: People want to find your physical location. If you can, provide functionality like MapQuest.com that will let them put their address in and it will give them directions. If not, then driving directions from a few different locations is good. Quilting classes and schedule: Put descriptions of your quilting classes, registration information, and a class schedule. This will help promote the classes. If you're lucky, you can register your quilt shop's name as the URL for your web site. 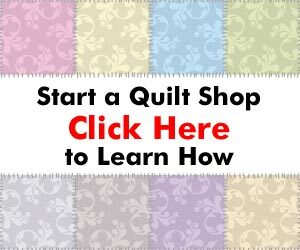 If not, try to think of a name that relates to your shop, or simply put a “The” in front of it (i.e., www.TheQUILTSHOPNAME.com). Design the site yourself. You can use one of the great new web design software packages available, such as Front Page or DreamWeaver. There is a learning curve, but if you can use a word processing program, you should be able to figure it out. Hire someone. Either a professional or a local high school or college kid. You would be amazed what children are learning today, and they can be a low-cost help to you. Just make sure you can work well with them so you have someone for the long-term when you need changes. Web Host with Templates. There are many web hosting companies that offer a template-based system for building your web site yourself. Basically, you upload your graphics and type your text into pre-designed grids. It's a great feeling when your site is up on the Internet and you get your first email from someone in another part of the company or the world. The Internet offers a tremendous opportunity for quilt shop owners, and it's a lot easier than you think. So go for it! PLEASE NOTE: This article and product review archive is here for your benefit. If you would like to use any of the articles or product reviews on your own web site or in your own email newsletter, you must include the resource box at the end of the article and also contact QuiltingBusiness.com to request permission.